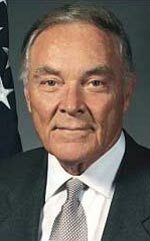 AKA Alexander Miegs Haig, Jr.
Military advisor to President Richard M. Nixon who, in October 1973, delivered Nixon's order to Attorney General Elliot Richardson to fire special prosecutor Archibald Cox when Cox's office came too close to unraveling the Watergate scandal. Richardson refused and quit, and Haig conveyed the same order to his second-in-command, acting Attorney General William Ruckelshaus, who also refused and quit. This left the more obedient Solicitor General Robert Bork as the highest-ranking member of the Justice Department, who promptly fired Cox as Haig instructed. Haig was later Supreme Commander of NATO under Presidents Gerald Ford and Jimmy Carter, and briefly Secretary of State under President Ronald Reagan.